PowerBook, iBook, iPod, and other portable computing is covered in The 'Book Review. iPod news is covered in The iNews Review. "When the short-range wireless technology called Bluetooth first appeared about five years ago, it was hyped as a way to finally sweep all those messy cables from our lives. Then cost and complexity took their inevitable toll, and many people wrote the technology off. Now Bluetooth is back, and it has become a useful tool in a variety of settings. "Bluetooth is also moving beyond hands-free phone use. Although Microsoft is a 'promoter member' of the Bluetooth Special Interest Group that's responsible for the standard, Bluetooth support in Windows remains primitive. "Not so with Apple Computer. The technology is standard in many Apple Macintoshes and optional in the rest, and with its new line of PowerBook laptops, Apple is the first to use a new, faster version of Bluetooth. If a Mac detects a Bluetooth keyboard and mouse during setup, it will automatically link to them." "The company behind the CherryOS Mac emulator has decided to release the source code of the product to put an end to accusations that it has taken code from open source projects. "Developers working on PearPC, an open source PowerPC emulator, claim that Maui X-Stream used code from the project to write its Mac emulator for Windows. But Jim Kartes, the president of Maui X-Stream, said it wrote the code for CherryOS from scratch." "For many Mac Mini users, upgrades will be a virtual necessity that cost more than upgrades to a Windows PC (see Battle of the budget PCs). And they're even costlier if you don't order them when you buy the computer (at which time labor is free), because they must be performed by an authorized Apple dealer or the Apple Store. Some important upgrades include: doubling memory to 512 MB (recommended if you run more than one application at a time), adding an internal AirPort Extreme Wi-Fi card (if you have a wireless home network), and adding a wireless keyboard and mouse or a DVD burner. There are also no audio inputs - just a stereo headphone jack in the back of the case - though Apple sells a $35 sound adapter that provides an input. "There are other hidden costs...."
"This document describes the security content included with the Mac OS X 10.3.8 Update, which can be downloaded and installed using Software Update, or from Apple Downloads. "For the protection of our customers, Apple does not disclose, discuss, or confirm security issues until a full investigation has occurred, and any necessary patches or releases are available. To learn more about Apple Product Security, see the Apple Product Security website." This developer note gives a technical description of the Mac mini. The note provides information about the computer's internal design, input-output features, and expansion capabilities. This developer note is intended to help hardware and software developers design products that are compatible with the products described here. If you are not already familiar with Macintosh computers or if you would simply like additional technical information, refer to Appendix A, "Supplemental Reference Documents", for details. The information in this note is arranged in four chapters and two appendixes. Chapter 1, "Overview to the Mac mini", introduces the Mac mini, describes its features, and mentions a few software issues of interest to developers. Chapter 2, "Architecture", describes the internal organization of the computer. It includes a functional block diagram and descriptions of the main components on the logic board. Chapter 3, "Devices and Ports", describes the I/O ports and the built-in I/O devices. Chapter 4, "RAM Expansion", includes development guidelines for the RAM expansion modules. Appendix A, "Supplemental Reference Documents", provides sources of additional information about the technologies used in the Mac mini. Appendix B, "Abbreviations", lists standard units of measure and other abbreviations used in this developer note. PR: Apple Computer's new Mac mini is flying off shelves. And, as usual, when Apple releases a new product, Other World Computing is there with hardware to enhance it. One reason the mini is so popular is its small footprint and lack of surrounding clutter. OWC offers three internally installed upgrade options, providing significant enhancement while maintaining the Mac mini's clutter-free appeal. 8x SuperDrive for $149.95, which is twice as fast as the stock option SuperDrive and has dual layer DVD burn support. For those who are comfortable doing the installation themselves, OWC has created a free QuickTime video demonstrating proper installation. But some customers already have been asking for professional installation, prompting the service's addition to OWC's catalog. "Although it's not the most difficult of installations, the Mac mini was not designed for easy opening," said Larry O'Connor, president of OWC. "That said, we're happy to be able to support the do-it-yourselfer as well as those who would prefer a professional installation be performed." For a $99 service fee, customers will receive a proper packing box for shipping their mini to OWC complete with a return FedEx Overnight shipping label. Within 24 hours of receipt by OWC, the customer's Mac mini is returned via FedEx Overnight with upgrade(s) installed. The original components are returned with the upgraded mini. Or the customer may take advantage of OWC's trade-in rebate program and get cash back instead. PR: Protect your priceless digital photos, critical financial records and all of your hard work with DiskGO! Portable Hard Drives by Edge. These sleek, aluminum-encased portable hard drives quickly and easily store up to 350 CDs worth of data. 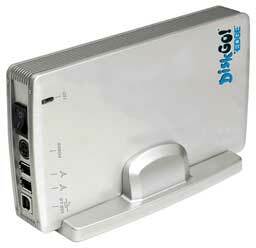 Ranging from 80 GB to 400 GB, the DiskGO! Portable Hard Drives are perfect for home or office use - freeing valuable hard drive space and providing a fast and convenient way to perform routine back-ups. With transfer rates up to 480 Mbs, DiskGO! Portable Hard Drive by Edge can back-up an entire notebook or desktop hard drive in just minutes. Don't risk losing thousands of dollars worth of work, years of valuable digital photos and more. PR: Addlogix's PowerReach DVI 2G include two of the most advanced DVI KVMs on the market today. First, PowerReach DVI 2G is a 2-port DVI USB KVM with audio support and an integrated USB 2.0 hub. The second model is PowerReach DVI 2G, FireWire Edition. Similar to the DVI 2G, DVI 2G - FireWire is 2-port DVI USB KVM with audio and FireWire support, along with an integrated USB 2.0 hub. Both models are designed to control two computers with a DVI display and USB keyboard and mouse. Both models are equipped with an integrated 2-port USB 2.0 hub and audio support that allow connected USB devices and audio components (microphone, speakers) be shared between two computers. The PowerReach DVI 2G, FireWire Edition further offers FireWire support that allows high-speed FireWire devices such as external storage drives to be switched and shared between the two computers. The one-of-a-kind "Independent Switching" makes peripheral sharing simple! Users can select the computers, the connected USB, FireWire devices, microphone, and speakers independently, using either front-panel buttons or keyboard hotkeys. For example, this special "uninterrupted connection" feature allows the user to control computer #1, while files are being transferred between a high-speed external drive that's connected to the KVM and computer #2. Similarly, user can get control of computer #2, while the speakers connected to the KVM are still playing the files from computer #1. As Apple's built-in firewall preferences improves in both functionality and security, I will be aiming BrickHouse more at users who need the advanced firewall configuration, logging, and IP sharing options found in BrickHouse. There is no reason that a new or inexperienced user cannot use BrickHouse, but Apple's own Firewall preferences will likely remain a simpler interface for configuring a basic firewall. Different filter configurations on different network interfaces. Access and ability to easily edit the raw firewall configuration text, including an integrated ipfw filter syntax checker. The ability to switch between different firewall configuration sets quickly and easily. ...then you should consider using BrickHouse. Tested on both Panther (10.3) and the latest seed of Tiger available at the time (8A425). Includes several changes to support Tiger. NOTE: It has come to my attention that this version no longer runs on 10.2 due to the being linked against the 10.3 SystemConfiguration frameworks. Updated (and now working on Panther and higher) online documentation under the Help menu. Please read the Read Me file for more information. Tested on both Panther (10.3) and the latest seed of Tiger available at the time (8A425). Includes several changes to support Tiger. NOTE: It has come to my attention that it does not run on 10.2 or earlier. Apparently the SystemConfiguration frameworks I linked against on 10.3 are incompatible. Updated (and now working on Panther and higher) online documentation under the Help menu. For deals on laptops, see our Best PowerBook G4 Deals, Best iBook G4 Deals, and Best iBook G3 Deals. For deals on iPods, see our Best iPod Deals.